Private Transport from San Jose or Liberia Airports or San Jose Hotels to Arenal Relax and enjoy the beautiful scenery of tropical mountains and farms as you drive to the Arenal region. Our driver will greet you at the airport or your hotel and help you with your luggage. There will be a stop for bathroom/snacks along the way. Journey time is about 3 hours. Afternoon. 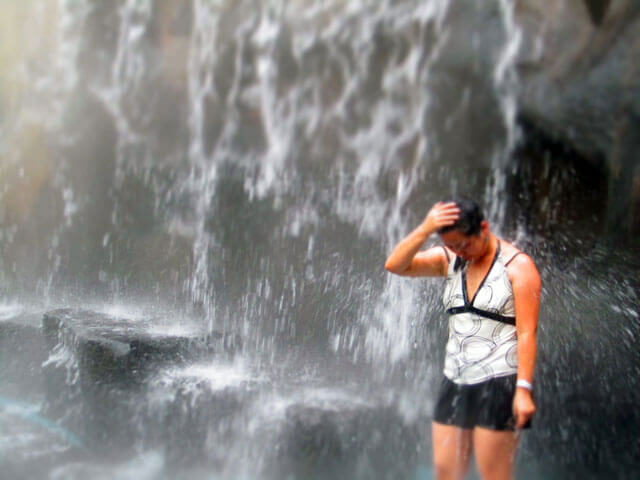 Natural History Rainforest Volcano Hike and Baldi Hot Springs plus dinner. A visit to Costa Rica is not complete without seeing Arenal's famous volcano! Hike through the Arenal National Park and rainforest with an experienced naturalist, bilingual guide who will point out flora and fauna in the primary and secondary rainforest that lines the base of the Arenal Volcano. Note though.. that it is more than 6 years since lava activity has been seen, although your can still hear it sometimes. However, tours are still very interesting as you learn about the history of this impressive volcano! Night at Hotel San Bosco (Standard Double Room with breakfast). Morning. Whitewater Rafting Class III/IV . Full day tour with 2.5 - 3 hours of non-stop whitewater action!! The river canyon includes exotic wildlife and continuous rapids. Bring on the adrenaline! Experienced and first-time rafters love the Río Sarapaqui for full-day, class 3-4 rafting. 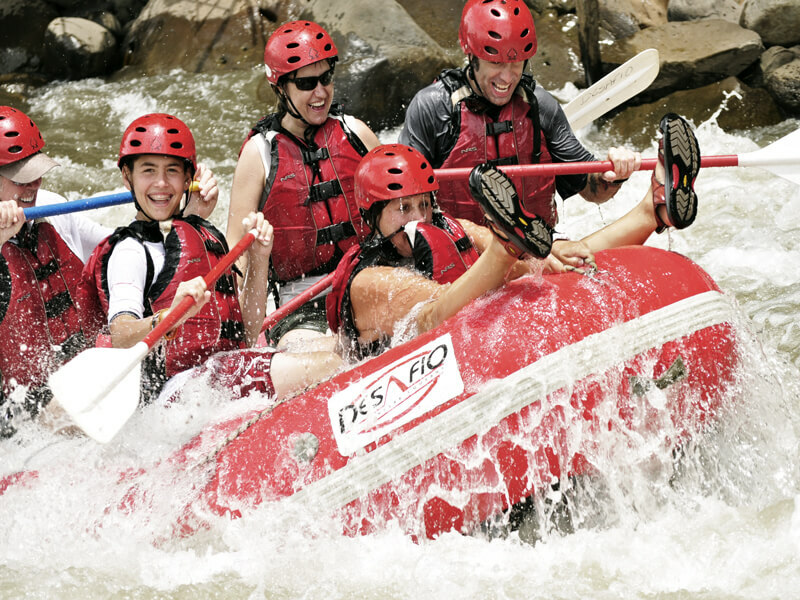 The Sarapiquí River is one of Costa Rica’s most-exuberant rivers and the perfect rafting trip for adventurous paddlers. 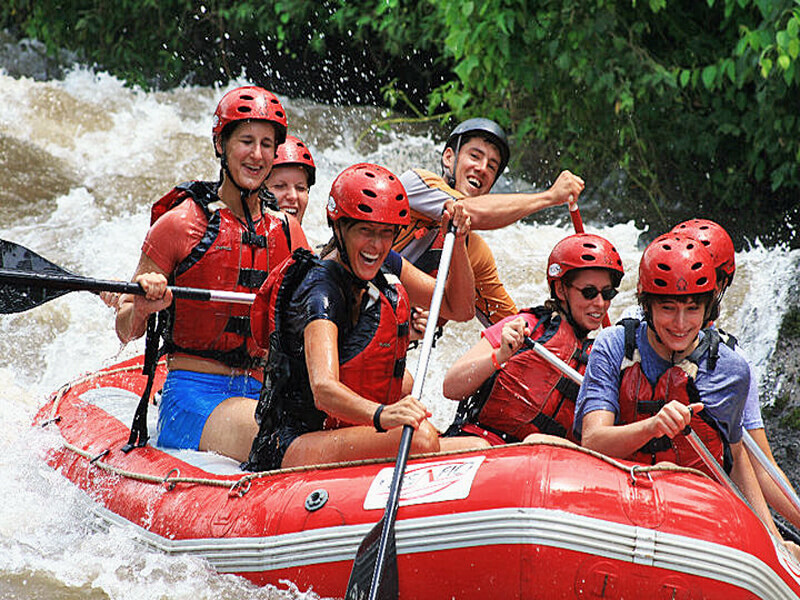 You’ll get about 2 - 2.5 hours of rafting with more than 12 continuous, class-3-4 rapids along more than 10kms of lush, vibrant rainforest. Make your way through exciting rapids like “The Pipeline,” “The Terminator,” and “Dos Locos”. 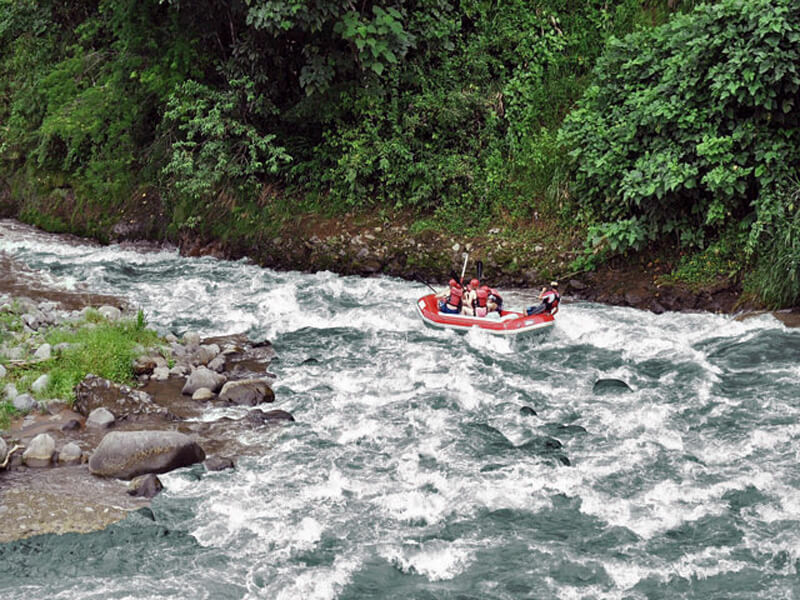 This fast flowing river has its origins from the mountains of central Costa Rica and runs to the border of Nicaragua. The Sarapiquí winds down a narrow waterway, surrounded by lush tropical vegetation, as well as farmland and towering trees. The area is habitat to several different species of birds such as toucans and hummingbirds. Frequently spotted are monkeys, iguanas and river turtles as well as sloths. The river is great for rafting, a mixture if exciting white water rapids and quieter sections for wildlife viewing and relaxing! Once at the river, our experienced guides will give you a thorough safety talk, get you set up with your helmet, life jacket and paddle and then you're off – we'll stop along the way for a nice, tropical fruit break and afterward we take you out for a typical Costa Rican “casado” lunch. Canyoneering is a brand new sport that’s becoming very popular the world over! 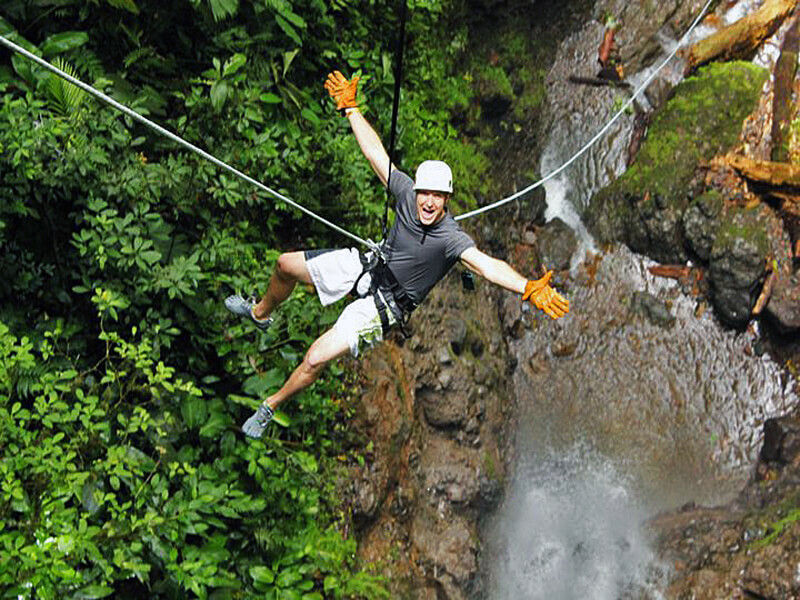 Located near the Arenal Volcano, our rugged, mountainous terrain is ideal for incredible canyoneering options & huge, breathtaking waterfalls! We combine rappelling, down-climbing and river tracing in a deep, tropical canyon. 1) Travel the old-fashion way! Start off by doing a fun 4x4 off-road adventure as you climb about 15 minutes up into a quiet mountainside community. 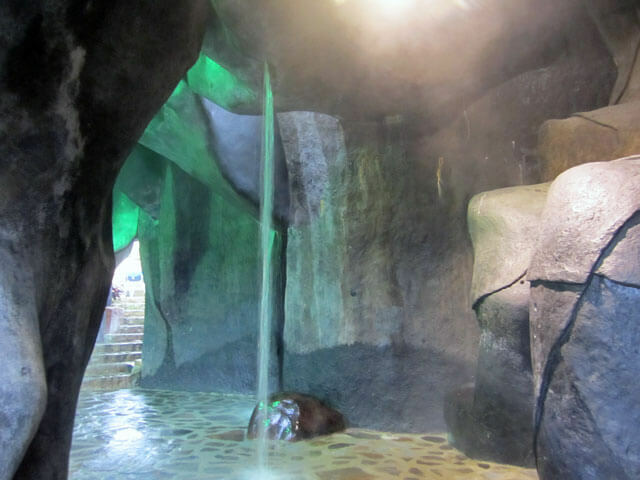 2) Prepare to get wet! Your guides will give you a thorough safety talk to explain important rappelling and down-climbing techniques. You will be provided high-quality technical climbing gear such as a harness, helmet & gloves. 3) Take a deep breath! 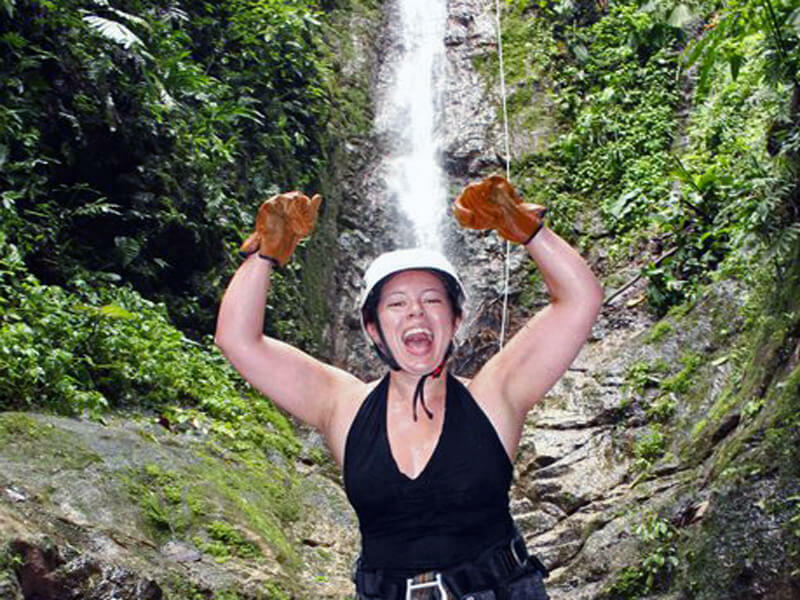 You’ll rappel down 150-ft waterfalls for the thrill of a lifetime! Make your way along the river bed by down-climbing and rappelling a series of 4 waterfalls that get gradually bigger and… BIGGER! 4) Save the best for last! 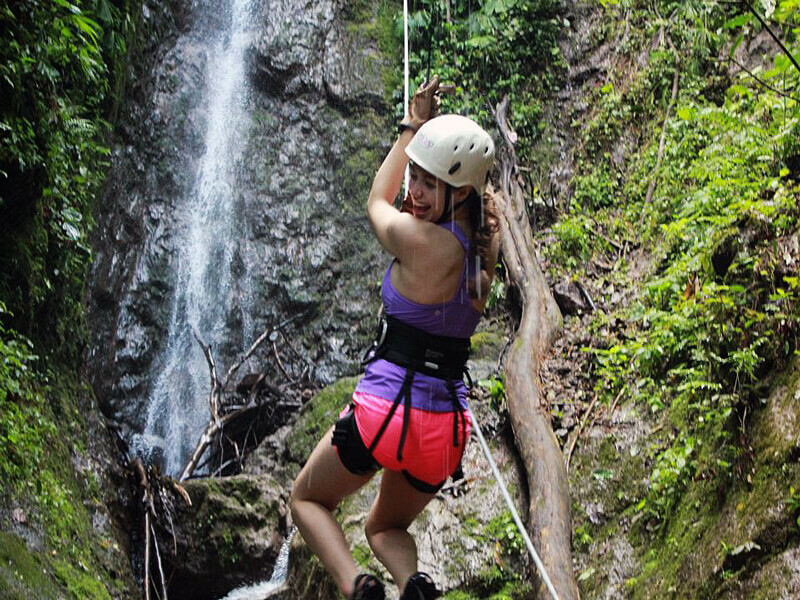 The biggest and most-exciting waterfall is your last descent… you’ll finish with a 200ft-guided-rappel at the end! 5) The hike back up takes about 10 minutes, but take your time to enjoy the intense rainforest that surrounds you! At the top, you’ll arrive to our Canyon House where you can change into your dry clothes and then sit down to your best meal in Costa Rica! Time for sun and fun on the beautiful beaches of Manuel Antonio! Shared transport to Manuel Antonio. Journey time 4-5 hours. Sail aboard the Tom Cat or the Spanish Dancer. 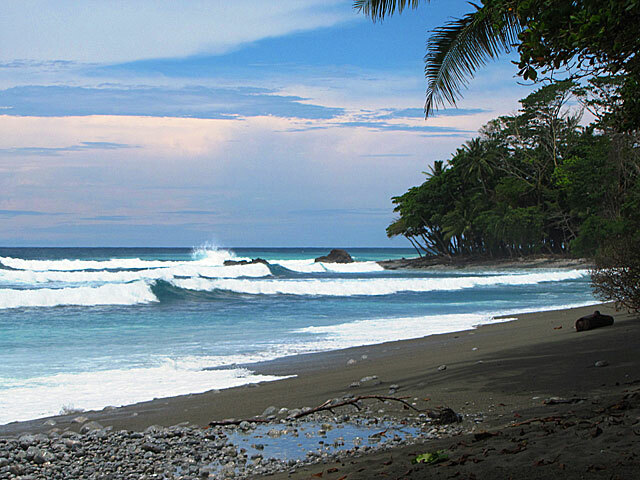 The Costa Rica Pacific coastline is one of the most beautiful in the world. The unique geology of the region insures a surprise around every island and shore. 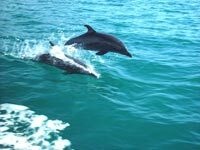 Come aboard and try and spot dolphins, whales, sea turtles, and birds of the Manuel Antonio Marine Preserve. Enjoy a feast of fresh fruits, grilled fish brochettes, pasta salad, drinks and the finest hospitality. Includes snorkeling equipment, a tour of the offshore islands and a delicious meal plus transport from your hotel Manuel Antonio. 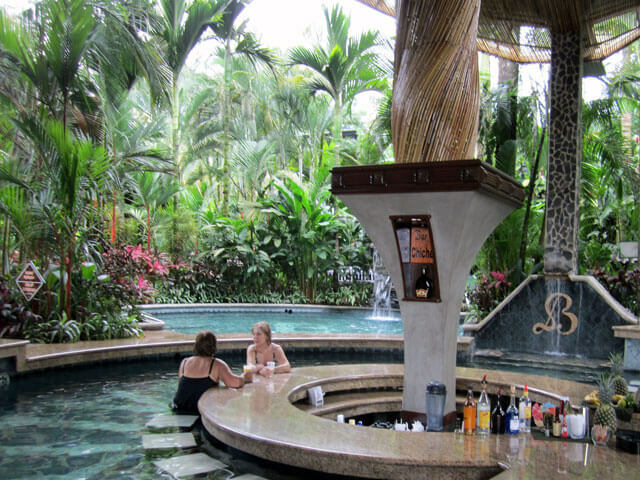 Arenal Volcano Hotel - San Bosco Inn: 3 nights. The Plaza Yara is located in a quiet part of Manuel Antonio, away from the main tourist area (a very inexpensive beach bus passes every 30 minutes to take you to the white-sanded beaches and the Manuel Antonio Park, less than 10 minutes away). All rooms at the Plaza Yara are suites with living areas and kitchenettes. They are extremely spacious and comfortable, decorated­­ with stylish bamboo furn. The back of the hotel faces a dense green jungle, lovely swimming pool and a relaxing balcony area. Minimum 2 people (Double occupancy): Prices FROM $972 per person. Please inquire about prices for your specific dates and any modifications you would like. What to Bring: T-shirts, shorts, light rain jacket or poncho, sandals (sports sandals are best), light hiking boots, sun screen, insect repellant, any personal medication, swimming wear, towel, traveler's insurance is recommended (to include adventure sports), full passport and a credit card (VISA and MC preferred, other cards are difficult to use sometimes).